Auguste Franchomme (pronounced "franc-OME") was the most renowned Parisian cellist of his time. He became a dear friend and frequent performance partner of Chopin, and the dedicatee of several Chopin compositions, including his final work, the Sonata for Piano and Cello. Their circle of friends included Liszt, Mendelssohn, George Sand, Charlotte Rothschild, and many other luminaries of 19th century Paris. Franchomme composed charming, virtuosic cello compositions, most of which are out of print and have never been recorded. The Franchomme Project album was released on the Delos label in the US and Canada on September 11th, and became available to the rest of the world through Naxos in November. It has extensive liner notes written by Louise Dubin, based on her research in France, and contains previously unpublished information and photos. A French translation of her notes by a direct descendant of Franchomme is also included. CD orders placed through this website's shop include a bonus 24-bit cello duo track! 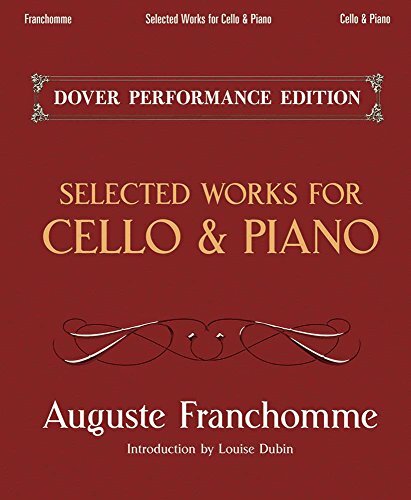 In addition, Ms. Dubin has transcribed Franchomme's unpublished cello quartet manuscripts, and her publication of these will be available in 2017 (please sign up for updates at www.blogdaysofauguste.com). She has given (generally premiere) performances of his compositions in New York City (earning praise in The New Yorker magazine and New York Concert Review), in the Salle Gaveau and the CRR (Paris), the Festival de Violoncelle de Beauvais (France), University of Connecticut, Grand Valley State University in Michigan, Chicago, Indiana, South Carolina, and Texas. For inquiries about a performance or lecture-recital on your concert series, or an interactive cello quartet presentation at your music school or cello conference, please get in touch through the CONTACT tab. Ms. Dubin’s research trip to France, funded by two Grant-in-Aid of Doctoral Research Awards from Indiana University in Bloomington, allowed her to visit the Music Department of the Bibliothèque Nationale de France. In large part due to the generous donations of Auguste Franchomme's direct descendants, the BnF houses the most complete collection of his works in the world, including copies of first editions of almost all of Franchomme’s published works (most of which are out of print and impossible to find elsewhere) and many unpublished manuscripts. Dubin also met direct descendants of Franchomme, who gave her access to unpublished family anecdotes, letters, manuscripts, Franchomme’s practice cello, and his library of cello music where she discovered forgotten compositions by the Baronesse Charlotte Nathaniel Rothschild (apparently plagiarizing Chopin works that had not yet been published!) Her discoveries inspired a paper which she presented at the International Women in French Biennial Conference at Arizona State University in Tempe in 2012 and at the Société des Professeurs Français et Francophones d'Amérique Biennial Conference (SPFFA) biennial conference at NYU in 2013. Her accompanying article appeared in the conference proceedings of Women In French; please see WORDS tab for more information. Trois Nocturnes Pour Le Violoncelle, Op. 14. One of the many original editions of Franchomme’s out-of-print works housed in the Bibliothèque Nationale Francaise in Paris. Reading room of the music division of BNF, Paris. 10 Rue la Bruyere, Paris. Franchomme spent his happiest years in this apartment, living here at least until 1850. Louise with Denys (last name removed for privacy reasons), descendant of Auguste Franchomme, relaxing at dinner after a tour of Parisian sites connected to his ancestor. Denys' French translation of the liner notes for The Franchomme Project album will be included in the CD booklet. Franchomme's gravestone, which has some lovely words he wrote about his wife, who predeceased him (as did his son and one of his two daughters). Louise with Sophie Ruhlmann in Blois. Sophie is a renowned Chopin scholar who has also researched Franchomme. Louise playing Franchomme’s practice cello, at the house of Thierry (last name removed for privacy reasons), its owner. Le Côteau is the since-enlarged house where Chopin and Franchomme spent a happy summer vacation in 1833. The house was owned by cellist/composer/lawyer Jules Forest, dedicatee of Franchomme's Adagio and Bolero. His daughter Adele was an accomplished pianist and the dedicatee of the Grand Duo Concertante on Robert le Diable. She began taking lessons from Chopin just before this vacation of his at her house. In September 1833, Chopin and Franchomme performed the piece in Tours (nine miles from Le Côteau), at a concert arranged by Jules Forest, in what may have been its first performance. Chopin remembered his vacation here fondly in several letters, and returned at least once more; Franchomme returned often. The son of Adele later bequeathed the house to Paul André, grandchild of Franchomme, and part of its surrounding forest to another grandchild, René Edouard André. Azay-sur-Cher, near Tours. Franchomme's affection for Touraine began at Le Côteau and he returned to the region throughout his life. His daughter Louise later purchased this house with her husband Edouard André, in nearby La Croix en Touraine. Later in his life Franchomme would often stay there. In 2005, it was sold by Franchomme’s descendants to the town, and is now the Town Hall. Louise with 7 direct descendants of Franchomme, Paris 2011: Elisabeth, Claire, Thierry, me, Denys, Marie-Christine, Florence, and Beatrice. A lovely 19th century painting of Auguste's son René in the background. René was a prodigy cellist and budding composer who died at age 19. Louise playing Auguste Franchomme's Forster cello at a party in Paris, 2011. Among the guests were the seven Franchomme descendants pictured above! Elisabeth P.-L. (great-great granddaughter of Auguste Franchomme) wearing a prized 19th century cameo of René Franchomme, son of Auguste. Here is a pencil drawing of Auguste Franchomme by Jean Massaud, 19th century. Click on it for a higher resolution downloadable PDF.